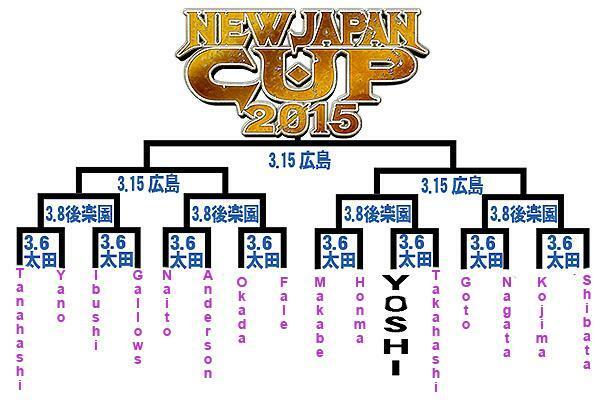 New Japan Pro Wrestling will be holding their annual New Japan Cup beginning tomorrow, featuring the some of the top heavyweights of the Japanese pro wrestling scene. Let’s take a quick look at the tournament itself and make some (snarky) predictions along the way. Let’s take a look at the preliminary matches scheduled to take place on March 6. Tanahashi is the current ACE OF (NEW JAPAN) UNIVERSE. Yano – or YTR as we prefer to call him – has been going with a comedy wrestler-like routine for the past few years. I don’t think NJPW would be willing to give YTR the win at this juncture over the ACE. Ibushi is a very popular up and comer in the NJPW ranks, with a Match of the Year contender already this time of the year (the Wrestle Kingdom 9 match with Shinsuke Nakamura). Doc Gallows should be familiar to WWE fans as the former Straight Edge Society member. It’s a very interesting clash of styles, but unlike Ibushi, Gallows isn’t going to be given any singles push any time soon. One of the interesting match-ups in the bracket, mainly because of how the bracket is shaped. Both are also former G1 Climax winners, so they are both legit contenders for any title at any time. Prediction: Anderson wins, but expect Bullet Club shenanigans. One of the matches with interesting history as Okada called out Fale back in February to avenge a previous loss (yes, there’s continuity in NJPW storylines). Also, an Okada loss would be devastating for him. DON’T MISS: Ring of Honor and New Japan Pro Wrestling to hold joint shows again! Prediction: Okada wins, but once again, expect Bullet Club shenanigans. Probably the stiffest match in the card. Both are fan favorites, and are two of the hardest workers in the NJPW roster. Not for the weak of heart. Two jobbers face each other in this filler match. YOSHI’s the fan favorite on this one as Yujiro turned his back on the Japanese fans by joining the Bullet Club. Prediction: Yujiro wins via Bullet Club shenanigans. Another match consisting of 2 more hard workers in NJPW. This match promises to be another stiff contest for sure. Another match that is not for the weak of heart. Kojima’s one of the oldest competitors in the roster (he even had matches with Macho Man Randy Savage in WCW back in the ’90s). On the other hand, Shibata is still quite young and about to reach the apex of his career.